Looking for a Used H3T in your area? CarGurus has 55 nationwide H3T listings starting at $13,900. 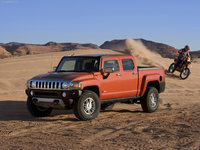 You could call the new 2009 Hummer H3T the ultimate go-anywhere, do-anything pickup truck/off-roader, thanks to its rugged pedigree and its undisputed versatility. You also could call it an anachronism in this day and age of high gas prices, hybrid engines, and smaller, fuel-efficient vehicles. However, the H3T should find acceptance with adventurous families looking for a highly capable truck that can easily morph into just about any type of cargo-carrying transport they require. In fact, hikers, campers, bikers, snowmobilers, kayakers, snowboarders, surfers, and just about anyone else who loves the great outdoors and travels regularly to places off the beaten path will find a lot to like about the H3T. Bikers and kayakers can customize the H3T with a roof rack, for instance, while snowboarders can add a slant-back hard shell that covers the H3T's cargo bed, providing a place to stow and protect their gear. Skiers can add a slant-back rack system designed to transport skis, while hikers can add a tonneau cover over the rear bed to create a place to stow climbing gear. An optional bed-mounted tent system will appeal to campers, while dirt bikers can add a bike chock (a cage-like structure that sits in the bed). In all, more than 125 dealer-installed accessories are available to customize the truck. The point should be obvious: The H3T can do just about anything you need it to do. 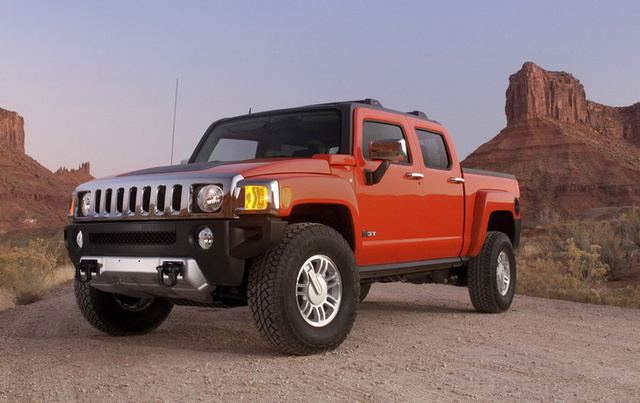 Based on the Hummer H3, the H3T midsize truck consists of a crew cab and a five-foot-long cargo bed. 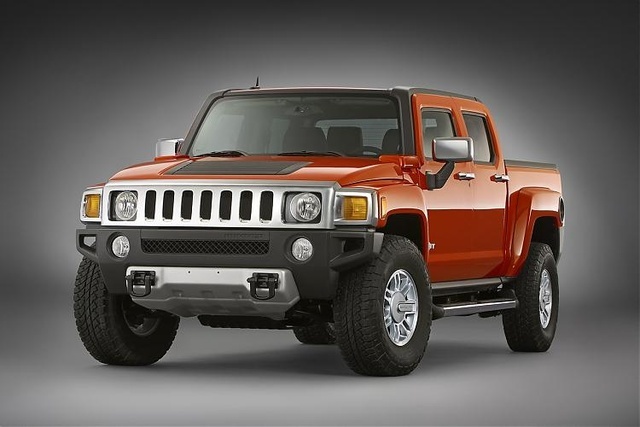 Its wide stance, low roofline, high beltline, seven-slot grille, and round headlights in square housings give it an unmistakable Hummer appearance. Off-road features include full-time four-wheel drive, 32-inch tires, and full underbody protection, including oil pan, transfer case, and fuel tank shields. Hill Hold Assist for improved hill ascension also comes standard. An optional Off-Road Suspension Package adds driver-selectable front and rear locking differentials and 33-inch all-terrain tires. Standard features for the H3T's interior, which borrows heavily from the H3, include air-conditioning, power windows and door locks, remote keyless entry, and an AM/FM radio with a CD player and XM Satellite radio. The 60/40-split rear bench seat folds flat when not in use to provide additional cargo space. Options include a premium Monsoon audio system, a navigation system, and Hummer's Rear Vision system, which includes a camera mounted on the rear bumper to assist drivers when backing up. The H3T is available in four trim levels. A 242-horsepower, 3.7-liter Vortec inline five-cylinder engine comes standard, although some reviewers find that engine uninspiring. It links to a five-speed manual transmission or an optional four-speed electronically controlled automatic. A 300-horsepower, 5.3-liter small-block V8 engine, designed by GM, is available as an option. 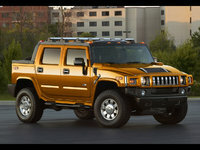 What's your take on the 2009 Hummer H3T? 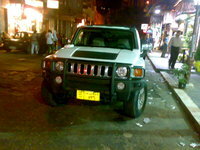 Have you driven a 2009 Hummer H3T? My Hummer Doesn't Start What Could Be Wrong? Is The Hummer Swim In Water? where can I get a Wheel Chock for my new H3T?